So as you can see the frequency of doubles, distribution of doubles, and number of doubles in a row are all within what would be expected. There is a group that continues to complain about the new dice code at SHG. While data is still being collecting for version .35 it is clear that all the versions from .28 produced the correct amount of doubles, or at least something very close to it. I keep hearing complaints of “one-sided dice” “6 doubles in a row” “20 doubles in a game” and players losing “time and time and time again” to multiple doubles at the end of the game. However, as far as I can tell no one complaining about this has produced even one match log, not less the hundreds that should be out their, to show that this is happening. I would love to see all of these match logs, if it is happening with anywhere near the frequency some people claim there should be hundreds of these kinds of matches. So please, attach you mat files to an email and send them to showmethelogs@gmail.com. For those of you that don’t know Neilkaz is Neil Kazaross, the all times points leader on the American Backgammon Tour and #5 on the 2007 Giants of Backgammon List. This post does not really related to the subject of the blog, but i am putting it here so people that ask me about it on SHG can have a reference for what is going on. If you see me (BigWill) kibitzing a lot of games on SHG it is because I am collecting data to continue a study of the dice at SHG. Mike Petch, who does a lot of gnubg development, is doing the analysis at this point, I am helping collect data. A few weeks ago in the bgonline.org forum there was a comment from Neil Robins that his XG gammons dice data from SHG showed less than the expected number of doubles. I doubted that could be true, so I analyzed my own matches. Doubles should occur 16.67% of the time, but on SHG they were only coming up about 9.2% of the time. If you want to read the whole thread that kicked off the whole thing you can find it here http://www.bgonline.org/forums/webbbs_config.pl?noframes;read=49530#Responses. Mike’s data for the old dice can be found at http://www.capp-sysware.com/analysis/shgold_stats.txt. Mike is a programmer and knows the people at SHG – he does not work for them, nor do I – so he let them know that there was an issue and shared our data with them. As of this writing the corrected dice code is in the Cove, Doubling Cube, and Lagoon rooms on SHG. The data we are collecting on the new dice is available here: http://www.capp-sysware.com/analysis/shgnewdc_stats.txt. This data shows that doubles are now as you would expect. A lot of people are complaining about the number of doubles, but the data speaks for itself. Mike is continuing to look for other anomalies such as runs in the data, but runs can occur in truly random data sets. A good introduction to the issue of statistically proving randomness can be found here: http://www.random.org/analysis/. Now if you are thinking that is a lot of crap to wade through I would say if you are not willing to spend the time to understand that then shut up about the dice, you don’t have a leg to stand on. For the rest of you, you now know as much as the story as I do. Mike and I have taken quite a beating in the room lobbies, particularly the Cove, over our "ruining" the play at SHG. Of course, all we have done is analyze the data before and after the change (actually Mike has done all of the after change analysis I have just been helping collect data), SHG has made the changes based on seeing the problem. However, one of the things that we have learned in the course of those lobby chats is that many people do not have a good grasp of probabilities or "randomness." For example one person told us that our claim that doubles should occur every 1 in 6 rolls was "subjective." Another person e-mailed Mike and told him that their understanding was that if the dice were correct than if you got a roll of 12, for example, you should not expect to see 12 again for 18 rolls. Neither of these, or many of the other things we are hearing from those convinced that the new code is generating too many doubles is correct. I am including this brief discussion to hopefully clear up some of the confusion people have with what they should expect to see in random dice. There are numerous places on the internet to find the basic dice probabilities for backgammon, so I am not going to repeat that here. The simple fact is there are 36 possible rolls, 6 of which are doubles. Therefore the probability of getting any double is 6/36, or 1 in 6. There is nothing subjective about this. 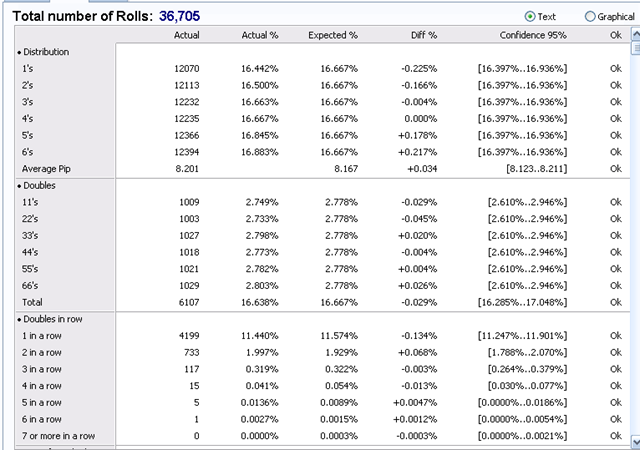 The next thing to keep in mind is that every roll of the dice is independent of the previous or subsequent rolls. The dice don’t remember what was rolled, so on any given roll the probability of a double is 1/6, the probability of any specific nondouble 1/18 and so on. Those that think that they are more likely to get a double this roll because they "have not seen one in while" are committing one of the classic gambler’s fallacies. Now, just because the probabilities of each roll are independent does not mean you cannot say anything about the probabilities of these independent events following one another. The math is very simple in this case, the probabilities of two independent events occurring is simply the probability of event 1 * the probability of event 2. So, if I ask the simple question what is the probability of throwing 2 doubles in a row the answer is simply 1/6 * 1/6, or 1 in 36. This is all pretty simple, but now things get a little trickier, and this is where a lot of people, I think, struggle with the dice behavior. Consider the following two sequences of rolls: 21 21 21 21 and 54 63 31 42. Most people look at the first sequence and see non-random and the second sequence and see random. However the probability of those two sequences of four rolls occurring from random rolls of the dice is exactly the same. Of course if we saw 12 repeated say 15 times in a sequence of supposedly random numbers we would have reason to question if the numbers were truly random because this has a probability of only about 1.4e-19 times, or 1 time in about 67,000,000,000,000,000,000. Notice I said question, not say for sure, we would need more evidence before reaching a conclusion. On the other hand, if I had a set of 100,000,000,000,000,000,000 random dice rolls the fact that I found a run of 15 12s should not be too surprising. The problem is that with smaller number sets it gets harder to say when a repeated sequence is evidence of non-randomness. There are various statistical test for runs in sets of data, but it has been shown that truly random numbers will sometimes produce runs that fail these test. Sometimes it easier to get a handle on some of the statistical oddities by experimenting. To illustrate this I simulated 216 matches (216 was chosen simply because I was using Excel to handle the data and this was the biggest set that easily fit) of 300 rolls each to see what kind of things came up. 300 rolls for one player is a realistic number of rolls for many 7-11 point matches, of course the real world number will be highly variable, but for the purposes of this experiment it works well. I downloaded simulated dice data from random.org. Random.org uses atmospheric noise to generate true random numbers and their numbers have passed a battery of statistical test. Short of rolling real dice multiple thousands of time this is as close as we are going to get to simulating true, random dice rolls. Repeated Sequences of Doubles: This is a complaint we hear a lot, "my opponent rolled 4 doubles in a row that never happens with real dice", for example. Well looking at the data from the simulation a sequence of 4 doubles in a row came up 38 times, and in 3 of the simulated matches this happened twice! Now from a pure probability standpoint a sequence of 4 doubles occurs only 1 time in every 1296 rolls. People see this and think that means that you will rarely see it, yet in our simulation it happened 38 times! (Actually 38 times is lower than what the probability would predict, which would be 50 times. And what about an even longer sequence of doubles? The longest sequence in the simulation is 7 doubles in row! Which would, based on the probabilities occur only 1 time in 279,936 rolls, but here it is a data set of only 64,800 random rolls. There were also 5 sets of 5 doubles in row, which a lot of people might question but is fewer than what one would expect. Rolling Multiples of the Same Double in a Game or Match: We hear people say something like "I got 13 double sixes in one game." In the few cases we have been able to get the match log we have found these types of claims to be greatly exaggerated. However, getting more, or less, of one double than expected is not all that unusual in these short sets of random numbers. I had one simulated match in which there were 17 double 6s in the 300 rolls, more than twice the number one would expect. More surprisingly, perhaps, I had a simulated match with only 1 double 1, another with only 1 double 2, and yet another with only 1 double 4. The probability of getting only 1 of a specific double in 300 rolls is 0.000006, or 1 time in 163,834 rolls. Yet here we have this low probability event occurring 3 times in a small set of simulated matches! Now rarely is anyone going to complain that I only got 1 double 1, yet the absence of these is just as powerful of an indicator of how far off from the "average" values short samplings of random numbers can be. Hopefully these couple of examples will help you to see that what some might think are evidence of non-random dice are actually events that occur with some regularity in short sets of data from a random source. I will end with one additional story. A couple of days ago I won a game in 15 rolls (I should have doubled and gotten out of it a lot earlier probably), of which 7 were doubles. This included back to back 66s, followed a few rolls later by back to back 55s. Now I am sure that some people well read that and say, see I told you there was a problem with the SHG dice! Only thing is, I was playing GNUBG! You need to come into a tournment room and sit and watch on how many doubles are rolled by one person it is insane and it isnt fair with all the doubles that are put out. I know exactly how many doubles are rolled because I have seen the analysis from several 100,000 dice rolls collected across the site, and have collect several hundred matches myself. The number of doubles is right on target with the expected statistical norms, so are the number of doubles by player when you break it down to seat 1 and seat 2 data. The problem is people got use to playing with doubles at much less than the expected value, so it seems like a lot. But it is the correct number, and the hard data proves it. Funny that no one that claims otherwise is ever able to produce a significant amount of data to show otherwise. I fact, they almost never are able to produce a single match log that has a huge excess in the number of doubles. YESTERDAY I PLAYED SEVERAL ONE ON ONE MATCHES, IN WHICH I FIRST BECAM AWARE OF THE MANY DOUBLES ROLLED IN ONE MATCH. WHILE I DID NOT KEEP A MATCH LOG, AFTER THE MATCH, I EXPRESSED SURPRISE ABOUT THE NUMBER OF CONSECTIVE DOBLE 6’S AND OTHERS. I WAS REASONABLY HAPPY AND SATISFIED WITH THE PREVIOUS RANDOM SELECTION OF NUMBERS ROLLED, AND FIND MYSELF DISSATISFIED WITH THE NEW FORMAT. THEE IS AN OLD ADAGE, “IF IT AINT BROKE, DON’T FIX IT”. The issue is that personal satisfaction has nothing to do with whether or not the dice are correct. It was broke, and it should be fixed. Unfortunately SHG has bowed to pressure of people that don’t like to play with real dice and gone back to the erroneous dice in many rooms, including all of the hosted tournament rooms except Gammonzone. As I enjoy the hosted tournament format I am greatly dissappointed by this as i refuse to play with the wrong dice. Thank you for a thorough explanation of this current discussion. I am impressed that you have done your research and the new system should be continued. As I began reading your explanation of the dice issue it occurred to me, just as you later stated, that players have been used to the lower than normal frequency of doubles. Correcting this would naturally be a suprise; sometime welcome, sometimes not. I’ve lost many matches recently due to a (perceived) high number of doubles. I’ve also won many the same way. One problem is we tend to “forget” (not realize) the wins but can get annoyed and remember all to well the losses. Thanks for your fine work on this. Your efforts are appreciated. The real thanks should go to Mike Petch who has spent a tremendous number of hours analyzing the data, but I am glad that you appreciate the change. I have had the sense of too many doubles in several matches, but when I have gone back and looked at the match files it turns out that this was not the case. As you pointed out some things stick with you more than others, and a couple of big doubles, especially near the end of match stick in your mind. While it is true that doubles can change a lose into a win or vice-a-versa I do think that many people are blaming the doubles when that is not really why they lost. I have my own story for that one, playing in the Gammonzone Gold Medallion Limited when the only correct dice where in the test room I asked my opponent to play there because the dice were as they should be. The round is best 3 of 5 matches, each to 9 points. We were at DMP in the 5th match, my opponent was on roll with 4 checkers on their ace point to the one on my ace point. My opp was even congratulating me when out pops 11 to clear his ace point, win the match and the best of 5 series! Mike Petch was watching and we even joked about the fact that if I had played in the other rooms with the lower doubles I would have likely won the match. It would be easy to blame the doubles for my loss, but when I analyzed the match later in gnubg it turns out that I had made an error earlier by bearing off checkers when I should have hit the blot that was still in my home board. Had I made the correct play it would have slowed my opponent down enough, even if they entered immediately, to have not been in a position to win with the 11. So it was not really the dice that cost me the match, it was failing to make the best play earlier that cost me the match. I would bet that a large portion of the matches people claim to lose because of the doubles are similar situations. Wow! This thread has been a very detailed and thorough discussion of the subject. A brilliant and logical explanation of why we should play with the “correct dice”. Otherwise we are not playing true backgammon. I have been playing backgammon since he early ’70’s in tournaments, ABT events and private money chouettes. I have spent many many sessions in chouettes that last up to 8 hours so I consider myself quite experienced with the way the dice fall. I might note that I always use precision dice. 1. I have rolled 66’s 3 times in a row live as well as on line. The dice are the same here as in live play. 2. People complain about rolling the number you need and that is why SNOWIE calls it a “Joker” roll.It happens live as well as here at SHG. This is a dice game folks! It happens in Vegas too at the crap tables. 3. When my opponents are beating me and they roll many doubles and joker rolls, I never hear them complain. Why is that??? Only when they make bad plays, horrendous errors and I roll a “joker” or dubs, do they star whining. 4. Maybe if we could have a little pop up window at the match table to keep track of each players doubles and jokers, those of you who whine will see how wrong you are. 5. Instead of focusing on the dice, how bout putting more thought into your checker play and cube actions?? When you leave an unnecessary shot and make a blunder and I hit it, that ain’t the dice folks!!! The bad is on you. If you read any of the discussion on the Madhouse forum you will see that a lot of the people whining about the dice don’t care whether the dice rolls are the same as you get with real dice or not, they want to play with fixed dice. That is why SHG eventually gave in and allowed hosted tournament groups to pick whether they wanted to use the old dice or the new dice. I guess that the fact that those rooms still have a lot of people playing in them tells you how many people are fine playing hackgammon instead of backgammon. So a live dice stat counter would not do anything to satisfy these people. In fact, it would probably make things worse because they would be whining and screaming every time the low probability sequences like 3 double 6s in a row game up without thinking about all the times they have played where it didn’t happen. While you do win and lose some games just because of the jokers (that’s the nature of the game) I agree with your comments that many times the real reason for the loss is not the doubles but some other error(s). It might be big blunders, or it might be a single smaller error as I related in a comment to another post regarding my opponent winning on a double when I had one checker on my ace point. Playing one roll correctly a few rolls early would have won the match for me. Sure the double was a joker, but still a joker my error had made possible. Don’t keep hiding behind the 16.67 number when frequent players like myself tell you the dubs are wacked. It is the frequency and sets(three or more in a row) that bother people. In 4,221 SHG matches have never saved a log and never will, and listen to dolts like SaltyPelican tell me it’s my quality of play. Would love to play on a live board and discuss quality of play at $10 a point. I am not hiding behind anything, the runs of doubles are well within the statistical norms. How do I know this? Mpetch has now analyzed over 1 million rolls since the dice change and the sequences of doubles are in statistical norms. I recently started using eXtreme Gammon for match analysis, it has a very nice dice analysis feature so I am able to look at my own SHG matches. Since I switched to XG I have analyzed 90 matches consisting of just over 25,000 dice rolls. The runs of doubles and all other dice statistics are well within statistical expectations. (I never play in the rooms that don’t use the standard dice, so these are for the real dice used in the cove, doubling cube, gammon zone, and a few other places). So why should I believe people that tell me the dice are “wacked” based on their feelings when I have hard data that tells me otherwise? Regarding level of play I cannot comment on yours, but I will say that I have seen cases in my own matches where had I made the correct play earlier the big doubles at the end of the game would likely not have cost me the game. And these are not necessarily large errors either, sometimes even a .03 error can turn what would have been a good roll into a crushing roll. Of course this is not always the case, as backgammon is a game of both skill and luck, but I think it is the case much more often than those that claim they only lose because of the dice would admit. I also find it interesting that the people who claim there are a problem with the dice seem to always be the people that don’t save and analyze their matches! I’m willing to wager that the majority of complaints come from average players. To be an better player one needs an understanding of probability and randomness. Ramdomness means sometimes things don’t go as expected.This could mean four doubles in a row or no doubles at all. I’m also fairly certain that most of the compaints come do not come from the victor. I’ve rolled real dice and wondered if they were loaded!! Random means sometimes you will lose a close one, in poker it’s called a bad beat down! !Bottom line is it is the same program for both players. END OF DISCUSSION! Thanks for the great article. Now, I understand why mpetch monitored so many of my matches without chatting. Thought he was CIA or something and tracking me…I never complain about dice costing me a match and it drives me CRAZY! when others do. Especially, when a match is 6-2 and I win the 7th point with 2 doubles in a row…they forget the other matches where their playing cost them. A random program is just that Random!!! Thanks for the great work and making SHG fun. I am not normally a complainer. I have played bg for years both online and in real life. I do not consider myself an expert, but I enjoy the game. I do believe in random dice, however, speaking in terms of both a winner and loser in SHGs I can say without a doubt, the amount of doubles do not appear to be “random”. I had no idea you needed to log games to show the dice rolls, but I will do that in the future. My last four games have had a minimum of 8 doubles and two have been over 15 doubles per game. That takes the fun out of the game whether I win or lose. 😦 Please consider returning to the dice to the original status. Thank you. I have no control over what dice are used on SHG, I merely got involved because I played a role in bringing the dice problem to light. You don’t say whether you are speaking of total doubles or doubles per side, but 8 doubles in a typical game does not sound at all unusual. 15, depending upon the number of rolls is not all that uncommon. Consider a game that last for 30 turns, that is 60 dice rolls. The probability of getting 15 or more doubles in 60 rolls is 0.0647, or to put it another way if you played 100, 30 turn games you would expect, on average, 6.47 games to have 15 or more doubles. Of course if you kept up with this and got say 12 games out of the 100 with 15 or more doubles you would still need a lot more trials before you could say anything about the dice, because if you did 100 sets of 100 games you would expect to have 2-3 sets with 12 or more games with this many doubles. The number of doubles is not “random”, the dice rolls are random but the frequency of doubles produced by a random set of dice has a set expected frequency of 6/36 or ~16.66667. How can you say anything “without a doubt” about the frequency of doubles when you are not actually collecting hard data? As you can see from my post I have collected, and continue to collect data, and it shows that the dice are well within statistical expectations. I play quite a bit on SHG–too much maybe–and I too have experienced matches where it seems likes there are way too many doubles. Often when I look at the dice data after the match I find that there were not really as many doubles as I thought during the match. I think part of this just relates to the fact that doubles stand out, especially when your opponent rolls a couple of doubles in rapid succession that turns the game around. At other times I do find that the number of doubles is somewhat high compared to the average but still not at all out of the question. Go back to my 30 turn game, lets say my opponent rolled 10 doubles in the course of the game. At 16.67% doubles that means my opponent “should” have rolled 5 doubles, but they rolled TWICE that many!!! Something must be wrong with the dice right? Not at all, because when I look at the probabilities my opponent, on average, will roll 10 or more doubles in a 30 roll game almost 2% of the time, or 2 games out of every 100. Depending upon my match schedule I could easily play 100 games in 3 to 4 days, so I am going to see those “high double” games on a fairly regular basis. see how often this has actually happened?